Do you use the Feel Felt Found Sales Objection technique? The Feel Felt Found sales objection technique is so effective that it has been used by sales professionals for decades. I was first introduced to it over 20 years ago and can recommend it as a great way to handle objections when used in the right way and for the appropriate type of objection. Feel Felt Found works in all types of sales; Retail sales, B2B, telesales, and Direct Selling to the public. The key to making it work is to use your own words and focus on the objectives of each of the 3 stages... Feel-Felt-Found. The sales people that don’t like this technique are usually those that have tried to use it with a prepared script, Keep reading and you’ll see what I mean. When your customer hits you with a sales objection that start with: I think, or I feel, that’s a great time to use the Feel Felt Found objection technique. It’s a really good way to handle sales objections that are a natural response, a first reaction to your product, by the prospect. They state the objection using emotional words related to how they feel. Your first response should use the word, Feel. That helps you to build instant rapport with the prospect. For those of you that use NLP in your sales pitch and presentations you can see how this fits well with matching the prospect’s representational preferences, and how you could develop the technique to use all the sub-modalities. The prospect is telling you how they Feel about the product or service you are presenting to them. You will see below that your first response addresses those feelings. There is no point telling a prospect to see, or listen to your answer, they are using their feelings and that’s where your answer to their sales objection must be targeted. Confused? Don’t worry, I understand how you Feel. Many sales people that I have presented this idea to have Felt the same, and what they have Found is that by reading the step by step guide below they have a wonderful sales objection technique that they understand and can use to close more sales. See the step by step guide below on how to put the 3 stages of the Feel – Felt –Found technique into action. Remember, although the guide gives you a lot of information the actual technique may be used with just 3 short lines. When your sales prospect raises an objection and starts their sentence with: I think, I feel, my thoughts are, or some other phrase that leads you to think this is all about their feelings, you aim your response at their feelings and thoughts. You want to empathise with your prospect and tell them that you can understand how they feel and why they have raised their sales objection. So you respond with a line that says you understand how they Feel or that you understand why they Feel this way about your product. Prospect: I like your product but I think it is too expensive. Sales person: I can understand why you might think that about the product. This first simple action takes the sting out of the sales objection. It says to the customer, and to you, that raising this objection is not going to stop you buying, or me selling. They may also be pleasantly surprised that you are almost agreeing with them when they were expecting a more argumentative reply. I say almost agreeing because you are saying you understand why they might Feel this way, you are not agreeing with their objection. There is a big difference. Step 2 is to let the prospect know that others, just like them, have Felt the same way, and when you answered their sales objection they went on to buy the product. This is using social proof as a motivator, and shows that others said the same and Felt the same, and they went on to buy. Your customer wants to be like others, we all do. Do you enter an empty restaurant, or do you want to go where others are already eating. It’s a built in safety instinct. If there are others at this waterhole it must be safe for us. Sales person: I can understand why you might think that about the product. Many other people, who are now customers, Felt the same way when they first considered the price of investing in our product. The Feel Felt Found sales objection technique says to your customer, the feelings you have at the moment have been felt by many others, and it didn’t not stop them buying. The reason it didn’t stop others buying is because of what they Found, and that is the next step. Now tell your sales prospect what other customers found when they bought from you. Not just enough to overcome the sales objection. This is your chance to show how great your product is. Tell them, others didn’t just find enough that their sales objection was no longer an issue. They found benefits that surpassed their expectations and gave them something that felt great. Sales person: I can understand why you might think that about the product. Many other people, who are now customers, Felt the same way when they first considered the price of investing in our product. What they Found when they compared the long term savings of our product against their current model was that over a period of time the product pays for itself. The Feel Felt Found objection handling technique lets your customer know that it is understandable that they have this objection to the sale. That it’s normal, it’s happened to other people just like them, and those people still went ahead and bought the product. The important point to remember when using this technique is to use your own words and make your responses sound natural. This is where your sales skills come into play and that’s why some people are better at handling objections than others. Here’s more help on overcoming sales objections. The course that I've used successfully with the sales teams I've managed and trained. And enjoy selling as you confidently handle sales objections. 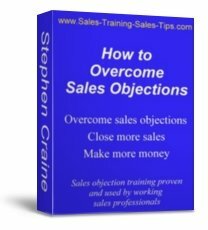 If sales objections are holding you back this sales and training solution will work for you, as it has already for many others. A no nonsene sales objection course in a workbook, that you can start using today to increase your sales results. Click the image or open How to Overcome Sales Objections for more information on this sales training course.